I’m happy to announce that the ServiceNow Integration extension is now available in the ScreenConnect Extension Browser. The corresponding ScreenConnect Integration scoped application is available in the ServiceNow App Store. The integration enables ServiceNow technicians to create and join ScreenConnect remote support sessions directly from ServiceNow incidents. After a technician ends a ServiceNow-integrated support session, ScreenConnect automatically sends session summary information back to ServiceNow, which is subsequently integrated with the corresponding ServiceNow incident. This makes it very easy to review and audit ScreenConnect session information without leaving a ServiceNow incident. Please download the attached document for comprehensive integration guidance. 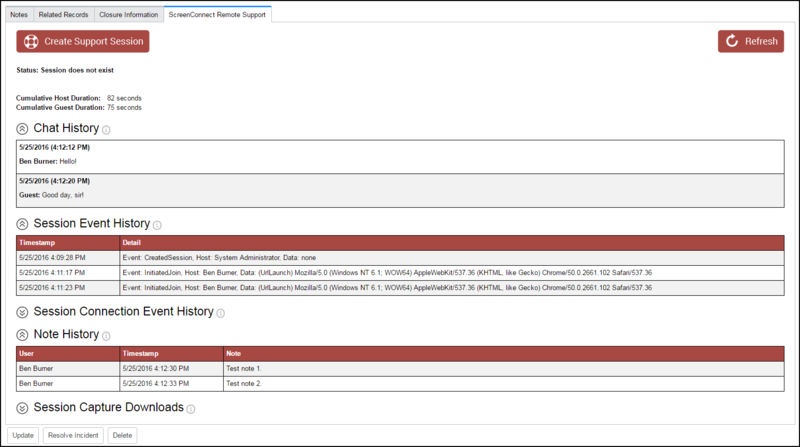 Figure 1: Default view of the ScreenConnect incident form section on ServiceNow incident with no prior ScreenConnect support session data. Figure 2: Technician clicks Create Support Session button; the incident will automatically update to show a Technician join button, a guest invitation URL, and a new status message. Figure 3: Technician clicks the Join button, which opens a new browser window that prompts the Technician to enter his or her ScreenConnect credentials before joining the session. Technician communicates invitation URL to guest. The Technician may click Refresh to check whether or not the guest has joined the session. Figure 4: Once the Technician ends the support session, ScreenConnect sends session summary information back to ServiceNow. The technician may click Refresh to view this summary information once it has been received and processed by the ScreenConnect Integration transform map. Note that all session date and time information is UTC. ScreenConnectIntegrationWithServiceNowGuide.pdf (296kb) downloaded 87 time(s). Can I please see the source code for this extension? We are looking to use ScreenConnect for our 2500 devices, but we need integration with our CRM. ==> if i can see the code, and integrate our CRM, then we will definitely signup with. is the code published on github? @alexdoan the code for any extension that has been installed to your ScreenConnect server/instance can be viewed either from the server itself (C:\Program Files (x86)\ScreenConnect\App_Extensions\[EXTENSION_ID]) or by installing the Extension Developer extension which then gives you the ability to view the files/code from the Extension tab in the Administration page. I'm trying to intergrate ScreenConnect into our ServiceNow instance and have followed the steps in the intergration guide. I'm able to create the ScreenConnect session from ServiceNow and it shows correctly when the session has been joined by the user. The problem I'm getting is that when I end the session the incident doesn't get updated with the chat/session history. 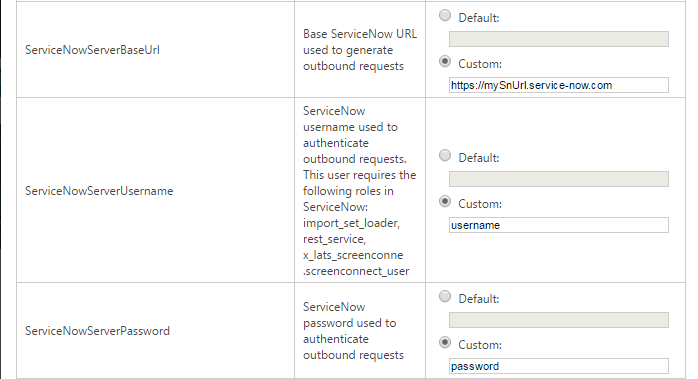 -Checked permissions on the ServiceNow login used for ScreenConnect as per the guide, I also used my Admin login instead to see if it was write permissions to the import set tables required for session data with no improvement. -We are using an on-premise install of ScreenConnect but I also created a new cloud install of ScreenConnect (14day trial) to rule out any network related restrictions causing the update set to ServiceNow to not populate the table and I'm getting the same result on the cloud install. Any ideas or suggestions to why the session data is not being imported will be greatly appreciated. @Ragman - I just sent you a PM with some additional information. The issue is perhaps related to how the ServiceNow Integration settings have been configured in ScreenConnect. Lastly, does the ScreenConnect --> Import Sets table in ServiceNow contain any rows? If so, does the session summary information appear as an import set row? 1 user thanked Ben B for this useful post. Please note that cloud-hosted instances of ScreenConnect will need to be on at least version 5.6.10753.5976 in order to successfully integrate with ServiceNow. I too am trying to get this to work between ServiceNow and my on premise ScreenConnect. I too am able to create the session, join the session, and provide support, but none of the details update back to ServiceNow during/after the session. I have verified the user account is the same on both sides and the roles required are assigned. My baseURL is also correct. Any help or direction you can provide would be greatly appreciated. Please PM me if this continues to be an issue -- I would be happy to schedule a troubleshooting session with you to get this working asap. This was working beautifully until we upgraded our ServiceNow instance to Istanbul. Is there a timeline for certification with Istanbul? Is there any chance we could get a copy of the ServiceNow application so we can customize ourselves? The updated ConnectWise Control app for ServiceNow was submitted to ServiceNow for review earlier today. ServiceNow is generally very responsive in regards to their app submission/approval process, and I expect the Istanbul-certified app to be publicly available soon. Is there an updated status on this? It's been a month since the submission. We would love to get this working again. The ConnectWise Control app for ServiceNow is still working its way through ServiceNow QA. While I'm unable to offer an ETA at this time, I will update this thread with more information as it becomes available. Would it be possible to get the code for the ServiceNow application? We would love to get this functionality working again in our instance. We have Jakarta in our environment, but plan to go to Kingston soon. Any help you can provide would be greatly appreciated. Would it be possible to get the code for the ServiceNow application? We would love to get this functionality working again in our instance. We now have Kingston in our environment. Any help you can provide would be greatly appreciated. I'm currently attempting to submit the app for re-certification on Kingston. I'll post updates about that as they're available. It's pretty crazy that your competitors (LogmeIn, Bomgar, Teamviewer, to name a few) can get their plug-ins updated and published but Connectwise Can't. It's not as if ServiceNow is some oddball SaaS app, it's a premium product with people with budgets for tools like CWControl/ScreenConnect, yet they may never evaluate it because of the lack of SNOW Support and integration. This isn't a development issue. We're unraveling accounts, etc on the business side with ServiceNow. We're working with their team to figure it all out, but the process is arduous. We hope to have it figured out soon. I'll be sure to update the thread if I get any additional info of a release. Apparently ConnectWise hasn't submitted anything. So regardless of the QA war ConnectWise Claimed, or ServiceNow claiming it wasn't submitted, I have no idea who is at fault. As of now, ScreenConnect is NOT supported a fault of their own, and there doesn't seem to be much resolution on the subject. Incident INT3972243 has been updated. "There was an application named "ScreenConnect" which is now withdrawn because its not supported for latest platform release. I dont see any request from the partner to get their application certified for latest releases." Please let me know if you have any questions or concerns with the above information. I am happy to help. My name is Chrystal, and I am the support engineer assigned to assist you with your issue. Please allow me the opportunity to reach out to the appropriate team to help facilitate this request. I will be sure to follow up with you but please let me know if you have any questions in the meantime. I am happy to help. I will provide you with an update once I have received the response from our App Store team. I am working in the EST time zone. Please note my working hours are 8:30AM-5:30PM. If you need assistance outside of this, you can call the Support contact number and another engineer will assist you. Details: We are looking at a product from ConnectWise that publishes themselves as a partner of ServiceNow. Their documentation (link below) shows that they should be available via the ServiceNow Store, but I can not find their entry. I've heard there may be an issue with their "certification". Can you share any info on the status of availability of this product via your "store"? Click here to view incident INT3972243. From what I've been able to gather, an important email (or emails) got lost somewhere, but apparently that is an unforgivable offense. I'd like to get this published just as much as you all would like to have it, but I can't force ServiceNow to cooperate. Thanks for the update Eric. I think there is a bit of tension because the application has been updated in over a year and 2-3 releases of SNOW. That being said, are you still at an impasse with ServiceNOW? I can contact our Account Rep and navigate the SNOW side as a customer to try and move things along if needed. Just tell me/us what you need. I am also willing to reach out to ServiceNow if it will help. We have missed this functionality for a long time and would love to have it back. I went ahead and engaged our SNOW Account Team this morning and will update the thread when I hear back. Someone from the ServiceNow ISV partner manager team reached out directly to Michael Bannerman at ConnectWise to explain that while ConnectWise had once been a ServiceNow partner with a certified integration, they were no longer in the program because their certification had lapsed. She asked if they wanted to rejoin and Michael said yes. The ServiceNow partner manager provided Michael with all of the necessary information and instructions, so once the ConnectWise folks complete what is required on their end, ServiceNow will reach out to ConnectWise to schedule a call to review the program and ensure it meets expectations on both sides. Once their integration is certified and listed, you will have the ability to formally consume this integration via the ServiceNow Store. I am not sure if there was some kind of communication issue or confusion related to the person who made the comments below, but ConnectWise has the information needed to re-certify and ServiceNow is committed to promptly responding once the application from ConnectWise is received. I hope this is good news and now we can have a Kingston/London plugin in the near future. I just got word from our partner manager that after some additional research and review, ConnectWise will not be accepted into the ServiceNow partner program. The guidance I was given is that if you are interested in obtaining the integration they’ve supposedly built, your best course of action would be to reach out to ConnectWise directly. I was told it was determined that there is too much overlap and too much of a competitive nature to the relationship. I've already begun a campaign of disappointment communications with my SNOW Account Team. I'm not sure how far it'll go, or how fast, but perhaps everyone else can do the same so it's not just one voice and maybe they will allow them to integrate. It's been a busy holiday season, my apologies for taking a while to answer your concerns. I just want to quickly chime in to give you all an update about what's going on with the ServiceNow integration. ConnectWise Control had an integration with ServiceNow that was listed in their marketplace until a couple of months ago. It wasn't compatible with Kingston and after some requests to update it, we began the process. After submission of our app, it was held by their technical team with little information as to why it wasn't certified. After some digging, we learned that ServiceNow was requiring that we register and pay for a new partner account in order to certify the updated integration we submitted. We're currently in the final stages of the process with ServiceNow (That's probably how they had my name on file, thanks SN team . Thanks for your patience as we get this all ironed out.